Jim Gavin’s side are unchanged for tonight’s game in Castlebar. DUBLIN HAVE NAMED an unchanged side for tonight’s trip to face Mayo in Castlebar. The All-Ireland champions defeated Donegal by five points two weeks ago and Jim Gavin has chosen to stick with the same 15 for their first clash against Mayo since last September. Stephen Cluxton will reach a century of league appearances for the county, but he’s still some way behind overall leader John O’Leary who finished his career with 127 games in the competition. Bernard Brogan underwent surgery on a torn cruciate recently and will miss the remainder of the season, while there has been speculation that Diarmuid Connolly and Paul Flynn will make their seasonal debuts off the bench tonight. Stephen Rochford named the Mayo team last night, with Andy Moran and Rob Hennelly drafted into the side. Email “Stephen Cluxton set for 100th league appearance as Dublin unveil team for Mayo”. 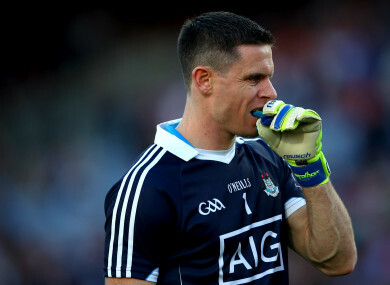 Feedback on “Stephen Cluxton set for 100th league appearance as Dublin unveil team for Mayo”.